B-MINCOME is a pilot project for combating poverty and inequality in Barcelona’s deprived areas. 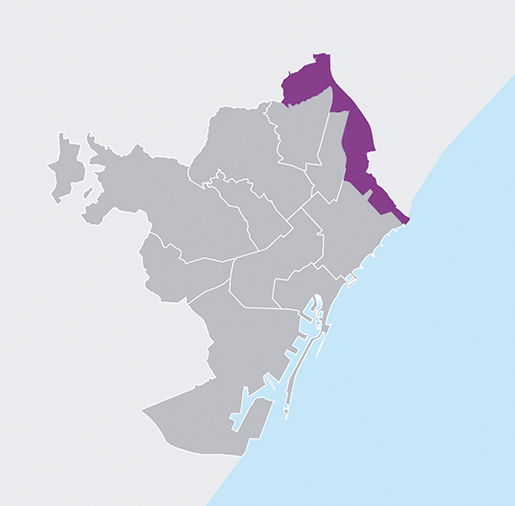 It consists of testing the efficiency and effectiveness of combining economic help in the form of municipal inclusion support (SMI) with active social policies in the Eix Besòs area, specifically the neighbourhoods of Ciutat Meridiana, Vallbona, Torre Baró, Roquetes, Trinitat Nova, Trinitat Vella, Baró de Viver, Bon Pastor, Verneda - La Pau and Besòs-Maresme. It will run for two years, from September 2017 to December 2019. This is an innovative project that aims to directly invest in people while seeking to improve their immediate surroundings, their neighbourhoods and districts. For that reason it combines economic support with four types of active social and workplace inclusion policies: training and employment, social economy, help in renting out rooms and fostering community participation. These are all jointly designed and implemented in collaboration with the various project partners and the area’s social fabric. The name B-MINCOME refers to another experience, namely Mincome, a well-known guaranteed-income project carried out at the end of the 1970s in Manitoba, Canada. The idea was to assess the social impact of a guaranteed, unconditional annual income, but in the end it was scrapped following the return of a conservative government and the introduction of austerity policies. Test the contribution of a future municipal inclusion support in ensuring that everyone living in Barcelona has a minimum income that enables people to have a decent life, giving them greater freedom and increasing their decision-making capacity and, therefore helping them to develop their own strategies for escaping poverty and dependence on public or private resources to cover their basic needs. Analyse the combination of municipal inclusion support with various active policies designed to improve the effectiveness (outcomes) of the fight against poverty, as well as the efficiency (reduced cost) of welfare and social-inclusion services. The aim is therefore to reduce poverty rates and, at the same time, measure the economic and social return on the income and policies applied. Check the project’s impact on some of the most important areas of people’s lives: work, family, health, subjective well-being, education and strengthening community ties. Create an innovative ecosystem of public policies to do away with the paternalistic and assistance-oriented perspective of some social policies that do not put the social rights of people living in poverty at the heart of their actions. A key element here will be the integration of various services and public policies linked to the fight against poverty and social exclusion in the area.